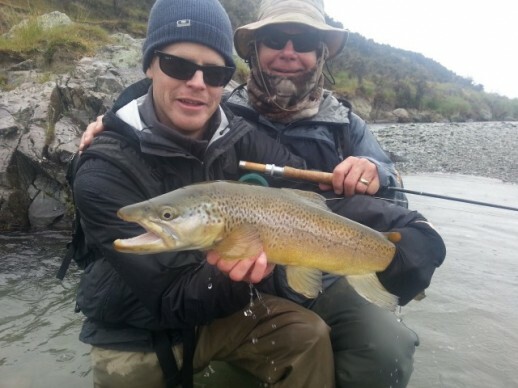 Your Southland Fly Fishing Explorer booking is not confirmed until a 30% deposit is received. On receipt of your deposit we will confirm your booking via email with you. The balance is due at the time of the trip and this can be paid using Visa or Mastercard but cash is always preferred. All clients are reminded to take out appropriate travel and cancellation insurance as required. Oct-November-December 5 deg C 25 deg C October, November and even December are our spring time months. January, February and thru to mid March are usually the warmest months. From mid -March onwards is heading towards autumn. The sun is very strong during the day and the clouds and wind can make the strength of the sun deceptive, so the use of protective gear is necessary all season long. You will be in and among many microclimates in a temperate part of the world and it can turn cold at anytime during the season, so come prepared for anything. To give yourselves the best possible experience I would thoroughly recommend that you get as much practice time (casting practice) in as possible before the trip. We get plenty of wind so being able to cast into wind, with wind across either shoulder and wind hard on your back is well worth while practicing. A double haul is also a strongly recommended skill to have. Being able to cast long leaders on short amounts of line and being able to cast very heavy flies are also important. If you turn up having worked on these skills before hand you will catch more fish and have more fun and my guidance will be worth more to you. Being able to make first casts count will get you more fish. Here is some great video info from a colleague of mine that will help with your practice time. Most of the accommodation is self catering with the exception of Fiver Rivers Retreat. Although the Oreti River House and Rod and Wheel may be able to provide meals on asking when booking. You will require to have your own breakfast food organised, however there is a basic store that opens around 0630 that you can get breakfast basics from. There are several restaurants in Lumsden to eat at should you prefer to eat out rather than cook for yourself, The Buzz Bar and Cafe, Route 6, The Bafe and Lumsden Takeways. It may pay to take a visit to the Queenstown New World supermarket in Frankton to pick up your supplies before heading down to Lumsden. Hours are 0800- 2100 every day. Simon has a well kitted large 4WD vehicle, with its snorkel and winch it goes just about anywhere. This will be your primary means of transport to all the fishing. If you wish to include a day fishing via helicopter into very remote areas there is a drive of approximately 45mins to our helicopter provider. Access by boat to some other remote areas (helicopters not allowed) is also possible, once again a drive first and then we boat to our chosen destination for fishing. Both heli-fishing and boat access fishing incur additional charges – you will need to talk to Simon about this. It can all be arranged quite easily at the time of your trip. If it is something you may be interested in it is best to let Simon know your interest when booking. The Southland Explorer focuses on the wonderful rivers, streams and lakes of Southland which does include the magnificent Fiordland. We may range into the Otago region at times. 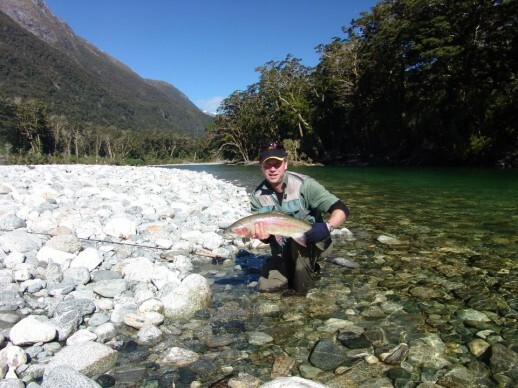 There is a wide variety of water to fish, large alluvial riverbeds, grass and tussock lined streams, mountain rivers that cascade through sub-temperate rain forests, freestone streams, crystal clear spring creeks, small tarns and large lakes, all holding large NZ trout. 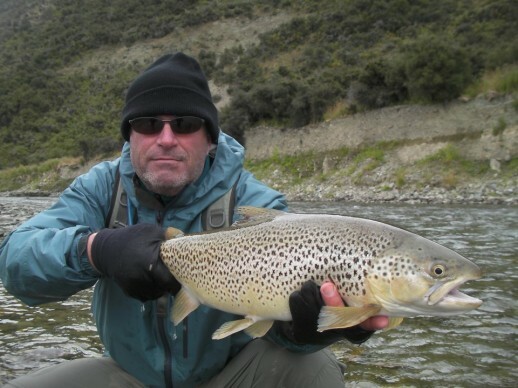 There are some significant differences in fly fishing for trout in New Zealand, Sight fishing is perhaps the biggest difference. 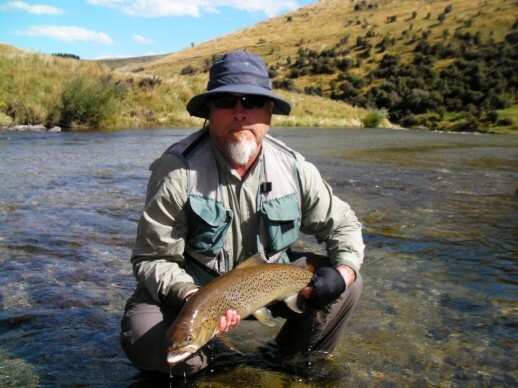 NZ guides are renowned for their remarkable ability to “spot” fish for clients, and to then coach that client into getting the right fly into the right place – and all too often the client never actually sees the fish until the fly is taken. Our crystal clear mountain streams and trophy sized brown and rainbow trout make this a hugely exciting method of catching these wild fish. This style of fishing is suitable for one or two persons per guide. The South Island’s countryside is diverse but generally quite open. The riverbanks are a mix of tussock grasslands and open riverbeds that are relatively easy to negotiate. We access a mix of spring creeks, alluvial rivers and still waters of various sizes and offer a choice of low country or high country fishing. The splendid fish of the high country demand respect for their sheer size and raw power. The larger, fit mountain rainbows will lead you in great leaps around the pool once hooked. And for the ultimate challenge, do battle with the cunning large brown trout that inhabit our lowland streams. They will test your nerves, skill and patience. In general we have fewer, but much bigger fish per mile of water. The best of our rivers might boast a modest 500 fish per mile, but many of the mountain streams and rivers might only hold 10 fish per mile. They are bigger, more alert and as wild as can be, with an almost uncanny ability to sense danger! Because there are fewer fish per mile, it becomes much more important to get a good cast to every fish encountered. As a rule, you only get one chance per fish – they are very unforgiving of poor presentation! 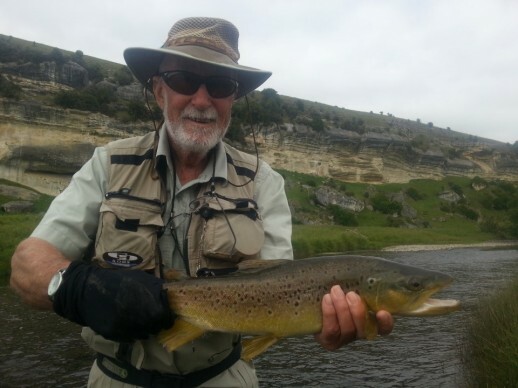 Water clarity is exceptional, especially in low summer flow periods, and wary brown trout can see out as well as the guide and his client can see in. Stealth is essential and fish will melt away unseen by the casual, careless approach of the average angler. There are few greater pleasures than to stalk our beautiful trout among the peace, solitude and majestic scenery of New Zealand’s Southern Alps. Generally speaking a 9ft 6 weight rod in a 4 piece set up is an appropriate choice to bring. We do fish into some quite strong wind at times! You may wish to bring a 5 weight as well in case a spring creek day comes along and some delicate presentation is required. For the most part the average size of fish is in the 18 – 24 inch (4lbs – 8lbs) range and reels with powerful drag systems are not required. There are some much bigger fish present and you never know when you might encounter one of them. It is therefore recommended that you bring a reel that is capable of handling at least 100 yards of backing. To be well prepared for New Zealand, anglers should include at least 2 lines to accommodate varying water levels and wind conditions. Weight forward fly lines are generally used. Floating lines are typically most useful in the presentation of nymphs and dry flies and to fish feeding on or near the surface and most fish feeding near the bottom will be able to be picked up using a double nymph rig below the floating line. Experience in the area indicates that when you are fishing nymphs and dry flies it is best to be using 9ft and 10ft tapered leaders finishing in about 7lbs. Tippet material will then be added to this to make your full length range anywhere from 12ft to 18ft depending on the conditions and waterway, time of season etc. Tippet material should range from 8lbs down to 3lbs. Mostly you will use 5lbs or 6lbs tippet material. 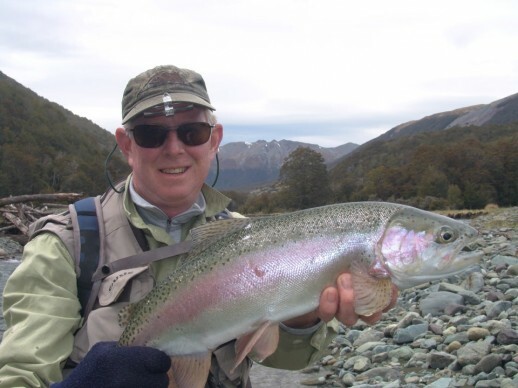 If you are not bringing your own fishing equipment there is a daily charge of NZD 50.00 per angler for waders, boots, rods and reels. Wading isn’t difficult in generally speaking in New Zealand and you will be spending a lot of time walking on the banks. Wet wading is the best style – long outdoor, quick drying style pants and shirts in dull colours. Thermal underwear is a good option to wear underneath these on the cooler days. However, we recommend you bring breathable chest waders for warmth on the colder days. Wading boots must have studs and rubber soles. Felts are now illegal in New Zealand. The summer climate of this southern region of New Zealand is extremely changeable, and a wide range of temperatures and weather conditions should be expected. We recommend layering clothing, enabling you to add or subtract garments during the day. Pack Polar fleece or down vests, thermal underwear, wool socks and a wool cap to be prepared for the extreme. Also take a reliable light weight windstopper/rain jacket. Most first-time visitors are surprised at how cold this region can become without much warning. Dull colours or camo is the best, stay away from bright clothing ! Catch and release is generally observed however you may take an occasional fish for the hot smoker from the right waterway. Please remember to wet your hands when handling fish. A small pair of pliers is useful for unhooking fish. A fish glove (polypro glove or a pair of your wife or girlfriends old stockings) to handle trout with will stop them from being slippery in you hands – we try to avoid nets as much as possible. Bring the same flies with you that you might fish for trout on the spring creeks and freestone rivers of the American west or larger chalk-streams of the UK except in slightly larger sizes, generally speaking. We suggest packing a range of flies in various patterns and sizes. Do not spend too much time on any fish that are dogo – Simon will explain. He will also have plenty of flies that you can use. NB. 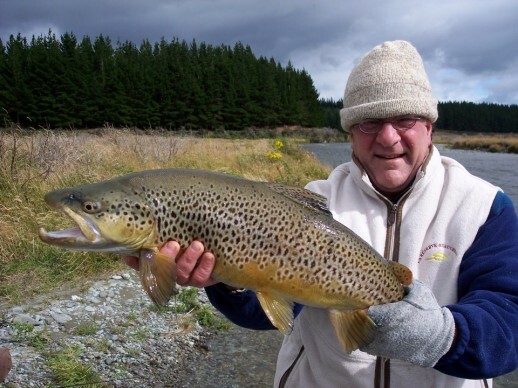 Most patterns that work in your home country will catch fish in NZ if fished at the right time and place with good technique. Very occasionally quite small flies may be required in the #18+ range but very occasionally! EQUIPMENT & CLOTHING CHECK LIST – Dress should be for rugged outdoors camping. The OZ tent is your home for the week and therefore your chance to relax in all that nature offers. Whilst fishing the temperature chart will give a good indication of the conditions at the time of your trip. Please bear in mind that the weather can be (extremely) variable. Where possible please pack all gear into a large hiking pack (we may need them if we do a short overnight mission away from main camp). New Zealand as a whole does not have a problem with mosquitoes. We do however have the infamous sandfly – these do not spread diseases, but they do bite and leave most unwelcome itchy bumps so as a precaution during all fishing months insect repellent should be used. The sun in New Zealand is very powerful and even with cloud cover the UV rays are strong. Please make sure you wear adequate sun-protection at all times. N.B. the info below may have changed and is best checked before travel through the appropriate agencies! All visitors to New Zealand must carry a passport that is valid for at least three months beyond the date you intend to leave the country. If you are visiting for three months or less and are from a country in the list below, you will not need a visa. Australian citizens and people who hold a current Australian permanent residence visa or a current Australian resident return visa do not need a New Zealand visa to enter New Zealand. To find out if your country qualifies for a visa waiver, check out the Visiting New Zealand section of the New Zealand Immigration Service Web site. You’ll find a list of all eligible countries and other useful visa information. Your travel agent, airline or nearest New Zealand Embassy will also be able to advise you if you require a visa. If your country is not on the visa waiver list or you wish to stay longer than three months you will need to apply for a Visitor’s Visa. You can download application forms from the New Zealand Immigration Service Web site, or contact your nearest New Zealand Embassy. New Zealand’s international airports are at Auckland, Wellington and Christchurch. Some flights from Australia also land at Hamilton, Palmerston North, Queenstown and Dunedin. Every person arriving in New Zealand must complete the arrival card handed out on the aircraft. Comprehensive advice for travellers is available on the New Zealand Customs ServiceWeb site. New Zealand’s agricultural industries are free of many insect pests and plant and animal diseases common elsewhere in the world. We put a lot of effort at ports and airports into minimising the risk of these being introduced. Heavy fines may be imposed on people caught carrying prohibited materials. On arrival visitors should place any questionable items, particularly fruit, in the bins provided. Firearms and weapons, unless a permit is obtained from New Zealand Police on arrival at the airport (includes sporting firearms).The New Zealand Police website has more information on importing firearms. Visitors to New Zealand may purchase duty-free goods, which are not subject to local taxes, from airport duty free shops on arrival and departure. Duty free stores in downtown Auckland, Wellington and Christchurch will deliver purchases to aircraft departure lounges. A tax of NZ$25.00 has to be paid at the airport when you leave New Zealand. Please note that this tax is not included in your ticket price. Numerous international air carriers serve New Zealand. New Zealand’s unit of currency is the New Zealand dollar (NZ$), comprising coins with values of 10, 20 and 50 cents, $1 and $2, and notes with values of $5, $10, $20, $50 and $100. Foreign currency can easily be exchanged at banks, some hotels and Bureau de Change kiosks, which are found at international airports and most city centres. All major credit cards can be used in New Zealand. Travellers’ Cheques are accepted at hotels, banks and some stores. Banks should be able to tell you what the current exchange rate is with the New Zealand dollar. The Reserve Bank of New Zealand provides a monthly online summary of the New Zealand Dollar’s average value against the US Dollar, the Pound, the Australian Dollar, the Yen and the Euro. Generally banks are open from 9.30am to 4.30pm Monday to Friday with ASB Bank being open in Queenstown until 8pm each night and open in the weekends. Automated Teller Machines (ATM) are widely available at banks, along main shopping streets and in malls. International credit cards and ATM cards will work as long as they have a four-digit PIN encoded. Check with your bank before leaving home. All goods and services are subject to a 12.5% Goods and Services Tax (GST), included in the displayed price. Visitors cannot claim this tax back, however when a supplier ships a major purchase to a visitor’s home address the GST will not be charged. As with all travel to remote wilderness destinations, we strongly recommend that clients purchase both trip insurance and medical evacuation insurance. 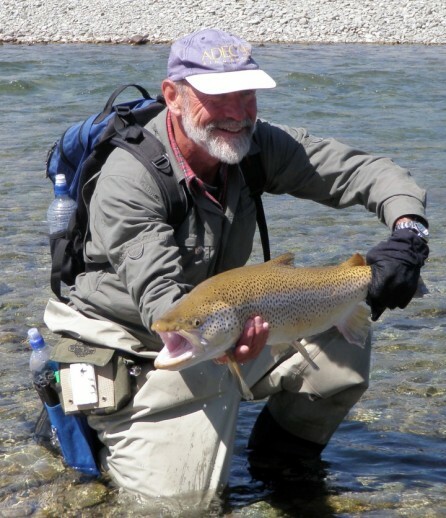 NZ Fly Fishing Expeditiosn and Simon Wilkinson Guiding will not be responsible for costs associated with medical evacuation, missed flights or lost baggage. Gratuities are not included in the cost of your trip. Gratuities are discretionary, based upon how you enjoyed your stay and the service provided.